Oh man, these balls are amazeballs. It all started when Belinda was in hospital. Her road to recovery was long and her appetite was lost and so the dietician prescribed some highly processed protein bars to rebuild her strength. These bars were sadly lacking in both taste and appeal and before long, Belinda had made her own uneaten protein bar mountain. We asked for other suggestions, of which peanut butter was (my favourite) one and so I set about making a peanut butter based snack that would tickle the patient’s fancy. I had just overhauled my pantry (excuse me while I shine my halo,) and had had a massive clear out so basically I used what I had and the result was ridiculously delicious. I took them to the hospital quick smart because I couldn’t have them in the house – they were way too irresistible! When I got to the hospital, poor Belinda was all kinds of crook, the poor love. There’s nothing worse than seeing someone you love suffering, although seeing someone you love going right off their food comes a close second. 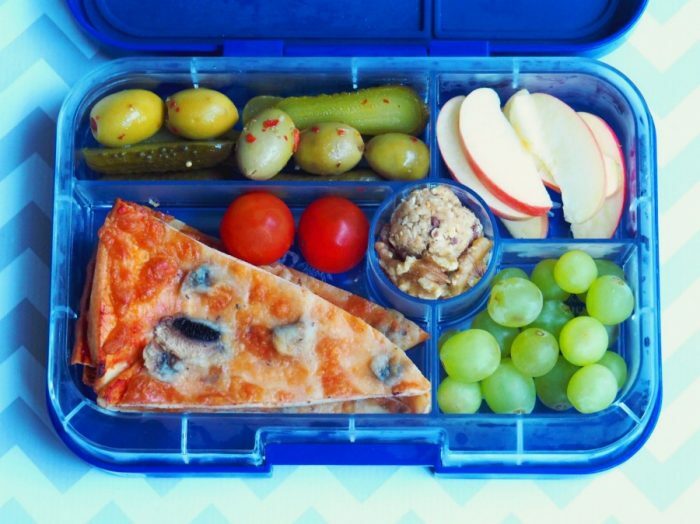 After picking at a hospital lunch, Belinda said she’d try just a bit of one of these balls and something amazing happened. Colour came back to her cheeks, she smiled a big smile and she took a little bit more, and a bit more and a bit more. She was packing in the protein with these balls. 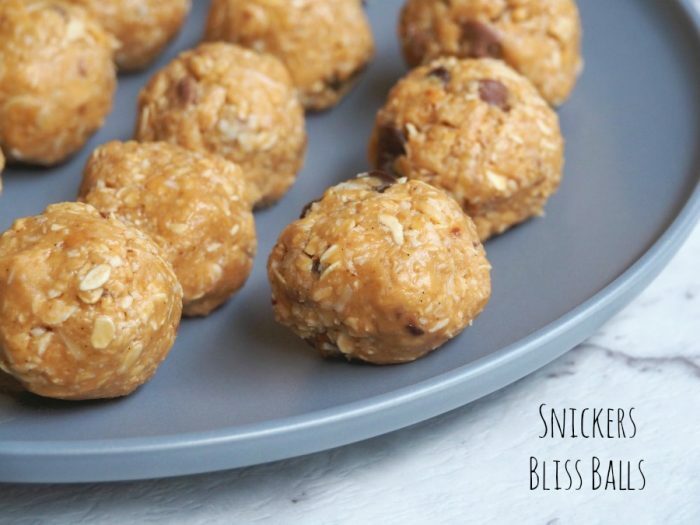 “Oh gee, these taste just like a Snickers bar, only better,” professed Belinda and so that’s how the name for these bliss balls was born. 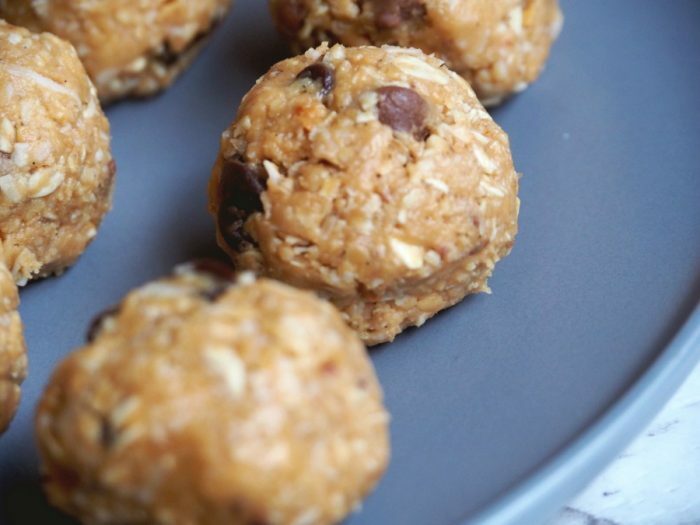 They do taste just like a Snickers – and don’t let that added coconut put you off – and although there’s a fair bit of honey in there, the coconut and the oats balance things out, so the balls don’t taste too sweet at all. The proof is in the eating because even David, he who dislikes peanut butter and honey can’t get enough of these balls! 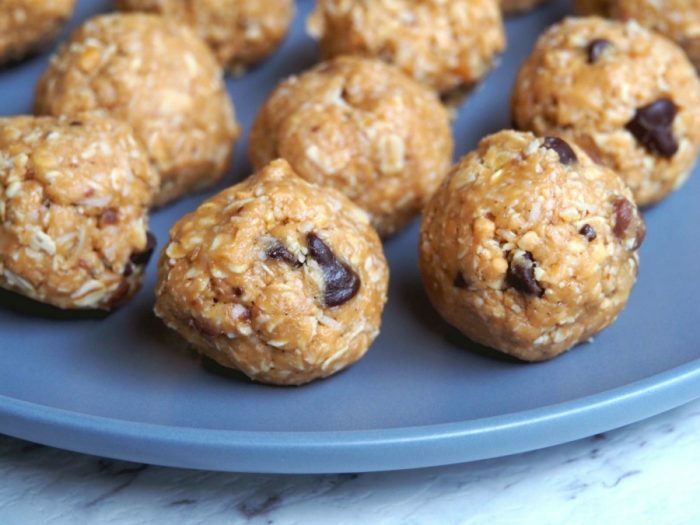 Of course, like any recipe, the better the quality of the ingredients, the better the quality of the end result and these balls are no exception. Use raw honey if you can and a “pure” peanut butter, one that’s just roasted peanuts and salt. I’m not going to make any crazy health claims about these balls, but they made Belinda feel better so they must have magic powers. Just sayin’! 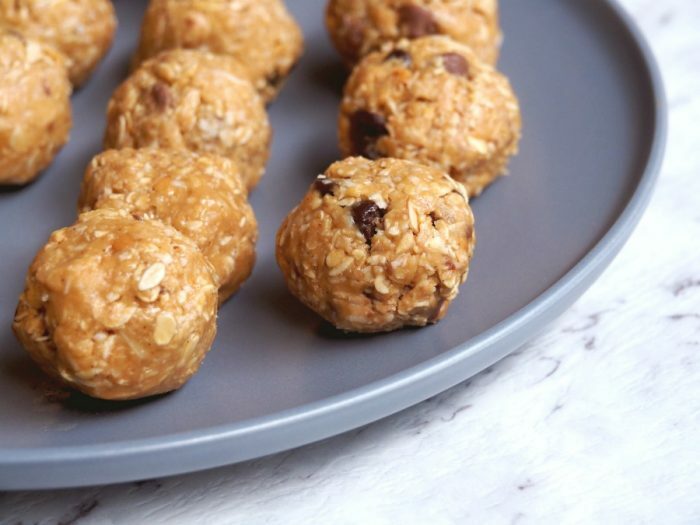 Anyhoo, you don’t have to wait to be sick to make these, they really are the most delicious treat and are perfect for a snack or afternoon pick me up and of course, they also go great in a nut friendly lunchbox. I have Belinda to blame for my new food addiction. The balls will keep in the fridge for up to a week, but you’re a better man or woman than me, if you can let them last that long! They’re amazeballs! Have you got a food addiction? Do you think food has restorative powers too? Place the ingredients in your food processor or Thermomix and blend until the mixture is combined but still has lots of texture. (Try about 5 seconds on speed 5 in the Thermomix.) The mixture should hold together when pinched, but if it’s still a bit dry, add a drop of extra water or maple syrup and blend again. Roll heaped tablespoons of mixture into balls and pop into the fridge. The balls can be stored in the fridge for up to a week.